Holy crap y’all. It’s been a hot minute since I’ve put up something for Teacher Tuesday, and to tell you the truth, I wasn’t really sure if I wanted to write this post. I, like millions of other Americans, was not emotionally prepared for Tuesday’s election results, and honestly, I’m still trying to wrap around my mind around everything. It’s even more difficult for me because I was an incredibly active member of the Democratic Party when I lived in the States. Even before I was old enough to vote, I was involved in the student campaign for John Kerry during the 2004 election. When I turned 18, I started volunteering for democrats running for mayor, governor, senator, state representative, and of course, president. I figured I would be involved in U.S. politics (and potentially even run for city councilperson one day) in the coming decades. But then I moved to Denmark. This was my first major election as an expat, and I must say, it definitely felt weird not volunteering. 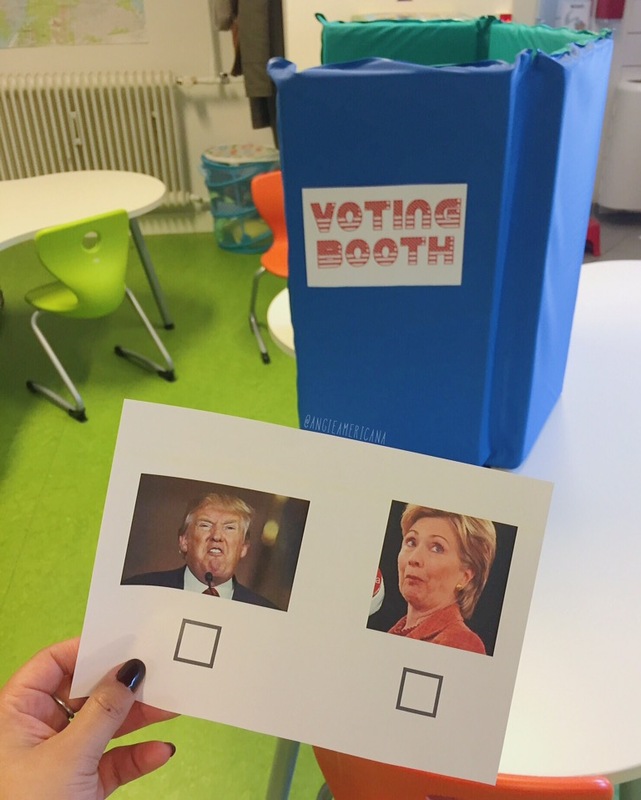 Like most people, I was feeling anxious about the vote on November 8th (and rightfully so….OMG), so to distract myself from the stress, I found a way to make it into a fun classroom activity. Now, you’re probably thinking, ‘Wait a minute, Angie. You teach preschool! The presidential election is WAY over your 4-year-old students’ heads.’ And yeah. You’re right. They don’t care about immigration or healthcare, and none of them are even American. But it’s never to early to learn the importance of voting. So when the presidential election came Tuesday November 8th, I turned my classroom into a polling place! During circle time, I showed my students pictures of polling places from around the world. We talked about how we go in one by one and take our time when making our decisions. 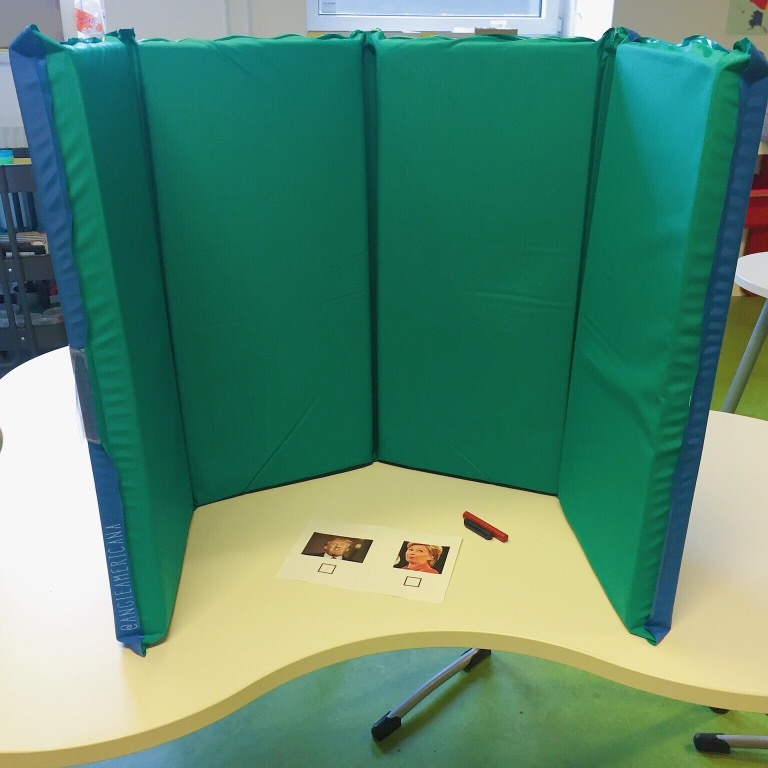 After our brief discussion, I set up our ‘voting booths’. It took all of 5 seconds. I created them by just standing up a nap mat on the table and slapping on a sign that read ‘VOTING BOOTH’. Easy peasy. The day before, I cut a slit in a box and painted it red and blue. Boom. Ballot box. 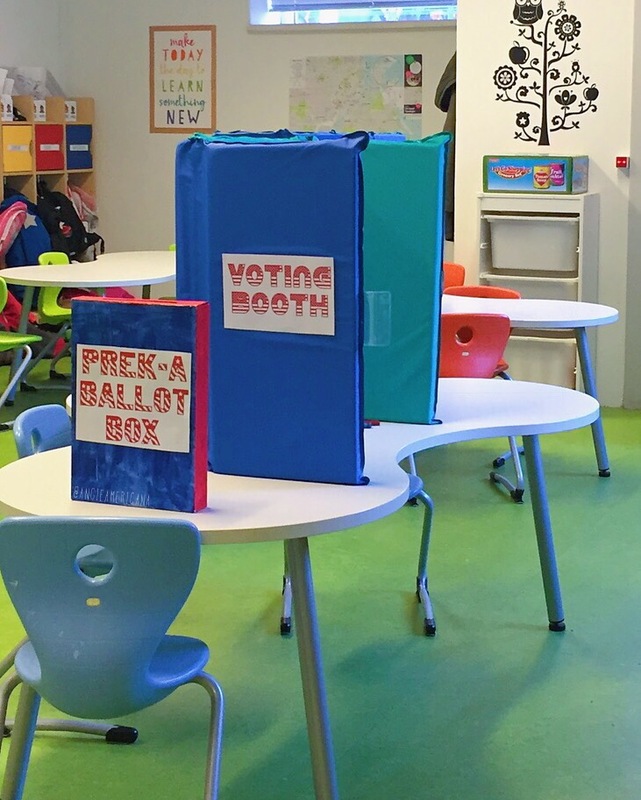 The interior of one of two ‘voting booths’. 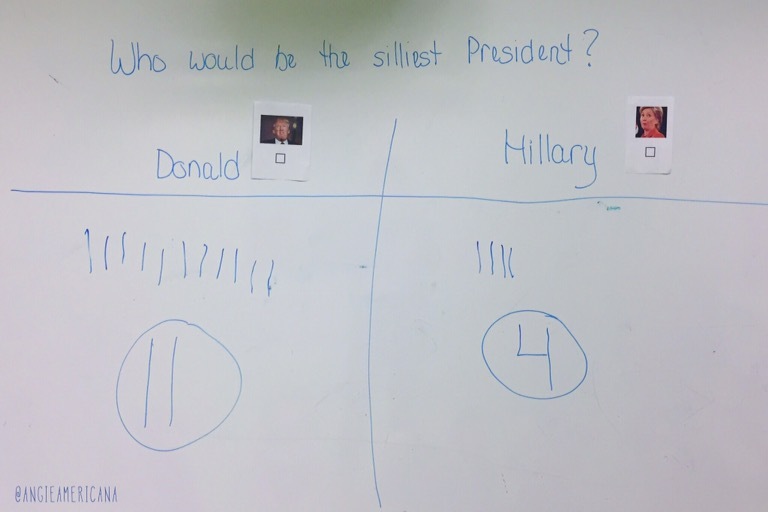 The students would be given a ballot with both candidates’ faces, and they would mark their choice with either a red or blue crayon. At this point, you’re probably wondering how in the world did I managed to make voting for president fun for preschoolers. I got them interested by morphing the election into something they would all enjoy. Instead of voting for who we thought would be the best president, we voted for would we thought would be the silliest president. I found the silliest pictures possible for the ballots. Before we started voting, I showed my class (age appropriate) videos and photos of the candidates making funny faces, dancing, making silly sounds etc. They thought it was funny to see adults being so goofy. I showed them the ballots and told them that they would have to color in the square under the person they thought was the silliest. I also showed them how to fold their ballot in half and put it in the ballot box. We then got in line and waited for our turn to vote. The whole class was excited to cast their ballots! 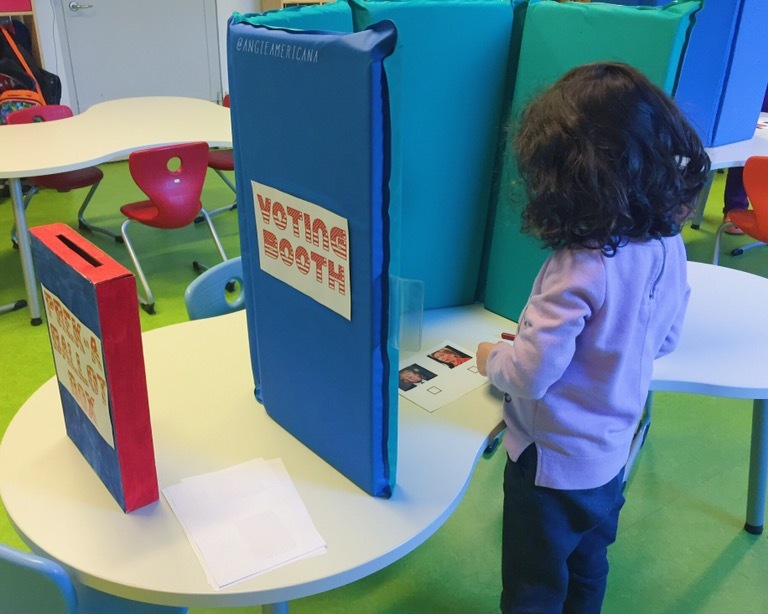 One by one, my students’ stepped into the voting booths. They all took their time and tried to make the ‘best’ decision. It was adorable to see how excited they got as they awaited their turn. It was also interesting to see how serious they became once they entered the booth. This student thought for a long time because she she ‘couldn’t decide’. This student voted confidently because he was ‘sure he knew who was funnier’. 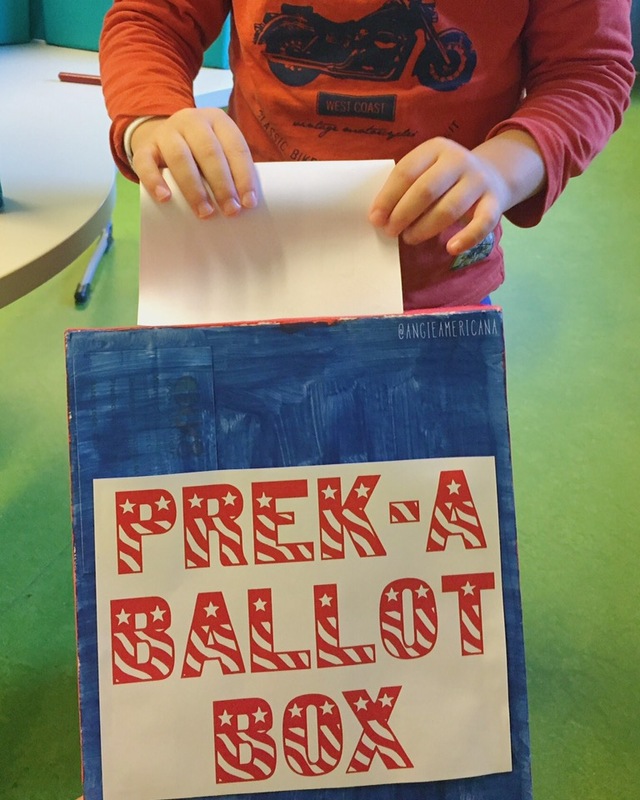 One of my students putting his vote in the ballot box. Once we were finished voting, we all gathered on the classroom rug again. All of the students were so proud that they voted, and they eagerly awaited the results. But first we needed to talk about the what would happen. We talked about the fact that someone would win, and someone would lose. We acknowledged that some of our friends would be happy, and others may be sad or disappointed. We agreed that no matter the result, we are still a class and will remain friends. I had so much fun introducing my class to idea of voting. Seeing them so excited definitely help me deal with my own election anxiety, and I’m really thankful that I got to share this with them. It’s just a bonus that knowing we will disagree from time to time has strengthened our classroom bond tenfold. Even in the short week since the election, my students are looking at their disagreements more rationally. Just today, I had two students arguing about which toy car was better. A third student walked over and calmly said, ‘You’re both right. You don’t have to like the same one.’ Problem solved. I think some people in the world (and especially in the USA right now) could learn a thing or two from these preschoolers. There’s no need to be a sore loser. There’s no reason we can’t be friends. We’re still a team, and we’re all in this together.